The delights of Acid Machine are just a click away. 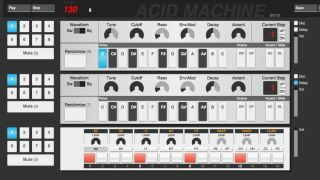 It might not quite be an online version of ReBirth, but Errozero's new Acid Machine - which is currently in beta - is another addictive web-based music-making platform. Comprising two synths and a drum machine (all with their own step sequencers, naturally), it operates and sounds pretty much exactly as you'd expect (and works best in Chrome, apparently). So, make sure your boss isn't looking at your screen and take Acid Machine for a spin.